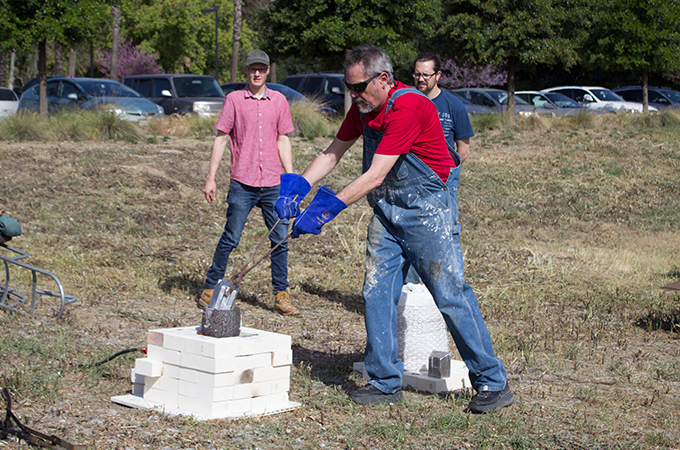 On Tuesday morning, Professors Raúl Acero and Qwist Joseph of the Studio Art Department and Professor Dustin VanOverbeke of the Biology Department—representing two seemingly opposite ends of the liberal arts and sciences at the University of Redlands—found themselves together in the field adjacent to Ann Peppers Hall. Passersby paused in their rush to class to stare, confused, at the scene: an amalgam of equipment, melting metal, and a group of men wearing bright green safety gear. 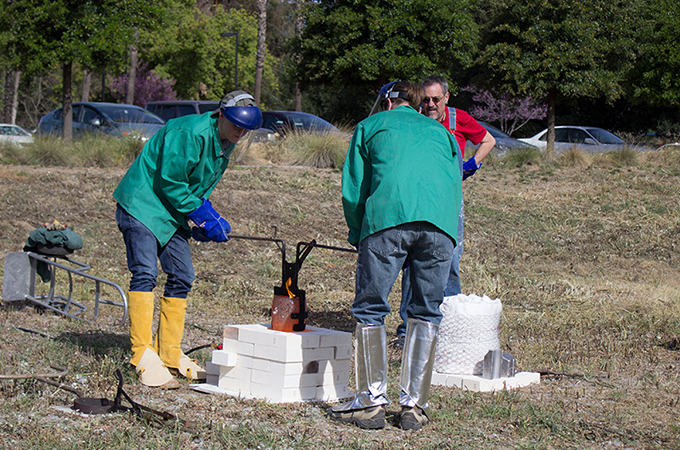 It turned out the commotion was caused by an endeavor never before attempted on the Redlands campus: the casting of an underground fire ant colony in aluminum. The project was set in motion when VanOverbeke, after noticing the recent spread of fire ant nests around campus, scouted for the invasive insects near Ann Peppers Hall. “I wanted to do an interdisciplinary cross between bio and art, because so much of biology is art,” VanOverbeke explained. “I contacted Raúl, and he was gracious enough to build this makeshift furnace and contact Facilities, whose members have been wonderful in helping out. Acero adds a block of aluminum to the crucible in his makeshift furnace in preparation for the fire ant hill casting. Acero was more than willing to help with the project—and not just for art’s sake. “When I was a young guy, my first teaching job was in Puerto Rico,” Acero told me. “I grew up in New York City, so I didn’t know anything about nature at all. I was living on this little farm, and it was beautiful. I was walking around barefoot and wandered out into the land. I was standing there and felt, very quickly, a lot of pain in both my feet. I was standing on a fire ant colony! The ants swirled all over my toes and bit me terribly, and I couldn’t get rid of them because they dig in. Acero explained that aluminum is easier to use than bronze because it only has to be heated to about 1200 degrees Fahrenheit, whereas bronze has to get much hotter—around 2000 degrees Fahrenheit. Sure enough, the aluminum melted after about 20 minutes, and VanOverbeke and Joseph, decked out in their astronaut-like safety gear, conducted the first pour. Using tongs, they carefully carried the crucible—now bright orange with the heat—over to the fire ant hill and poured the molten metal inside. 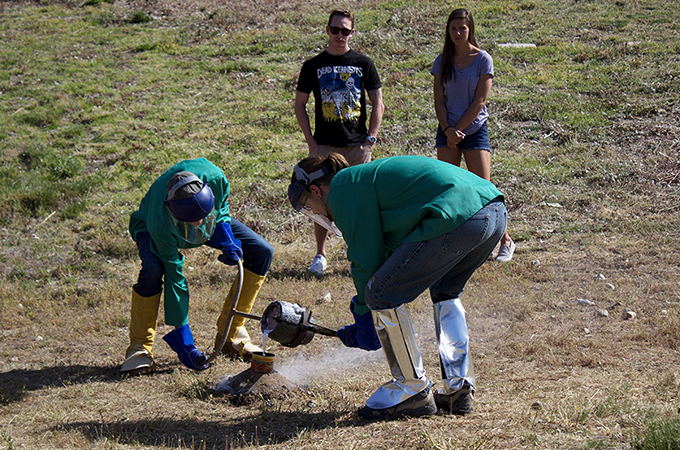 Joseph (left) and VanOverbeke pour the molten aluminum down the ant hill. The hill easily swallowed it up with a billow of smoke, and it was evident that a second round of melting and pouring was necessary. The crucible was placed back on the heat, and Acero added another brick of aluminum. Once it melted, VanOverbeke and Joseph conducted another careful pour, which this time resulted in a bit of an overflow and a few small flames that were quickly stomped out. 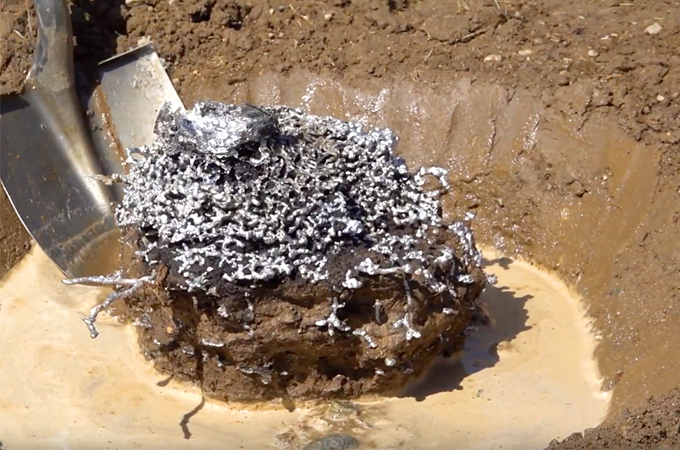 Time was allotted for the aluminum to cool, and then the digging began. VanOverbeke and his entomology students gently went to work with shovels and trowels, trying not to break off any pieces of the sculpture. Water was added to loosen the earth, and, after a lot of effort, the aluminum creation was finally freed. VanOverbeke hosed it off, and we were left with a beautiful root-like sculpture of underground ant trails. 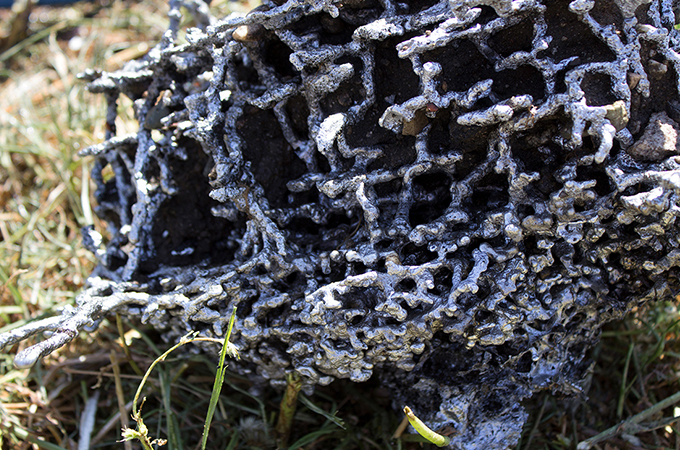 A closeup of the aluminum casting displays the intricacies of the ant hill's underground structure. I learned later that VanOverbeke and his students had continued to dig, and it turns out there was more to the sculpture than we’d originally thought. The colony branched more deeply underground, but the stalks were so fragile that they’d broken off. There are plans to attempt a reattachment of the pieces. Check out the video below to watch the whole process. To learn more about the Biology and Studio Art Departments, visit their web pages.